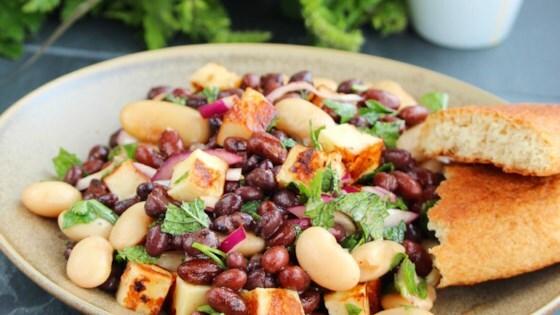 "Pan-fried halloumi, 3 types of beans, red onion, fresh coriander, and mint are tossed with homemade vinaigrette for a unique salad your taste buds will love." Heat a large nonstick pan over medium-high heat. Cook each halloumi slab on all 4 sides, about 5 minutes. Set aside and allow to cool slightly; cut into 1/4-inch cubes. While cheese is cooking, whisk pomegranate vinegar, honey, harissa, olive oil, and black pepper together in a dressing jar. Set aside. Combine black beans, kidney beans, white beans, onion, mint, and coriander in a bowl and toss with a spoon. Add cooked halloumi. Drizzle vinaigrette dressing over salad and toss to coat. Cover and allow to sit at room temperature at least 15 minutes.